SITE DIARY: How Strong Is Anglo-Saxon Concrete? It’s our final episode from Lindisfarne, time to share our favourite discoveries over a pint. Same time, same place next year! DigVentures will lead a two-week excavation in June 2016, to investigate the geophysics results and establish whether they are indeed the remains of Oswald’s Anglo-Saxon monastery. Archaeologists carried out a village-wide geophysical survey, and discovered a number of areas containing remains (including some near the Norman Priory), which may relate to the original Anglo-Saxon monastery. 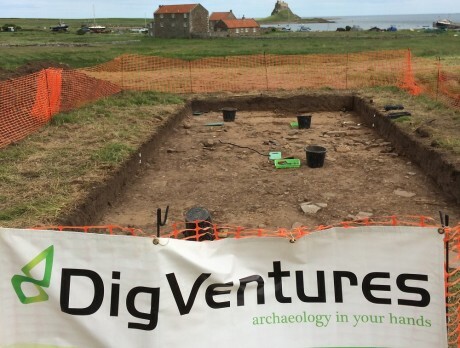 A series of small excavations took place across Lindisfarne ahead of construction work, providing tantalising hints of Anglo-Saxon and other early medieval features across the village. 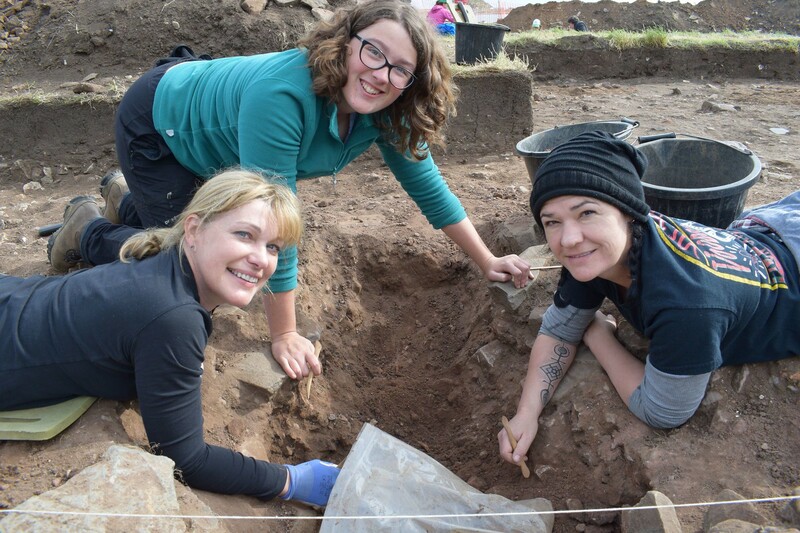 Archaeologists from Leicester and Lampeter Universities investigated the north side of the island, and found a range of sites including flint scatters from Mesolithic hunter-gatherers, and an important early medieval farmstead at Green Shiel. 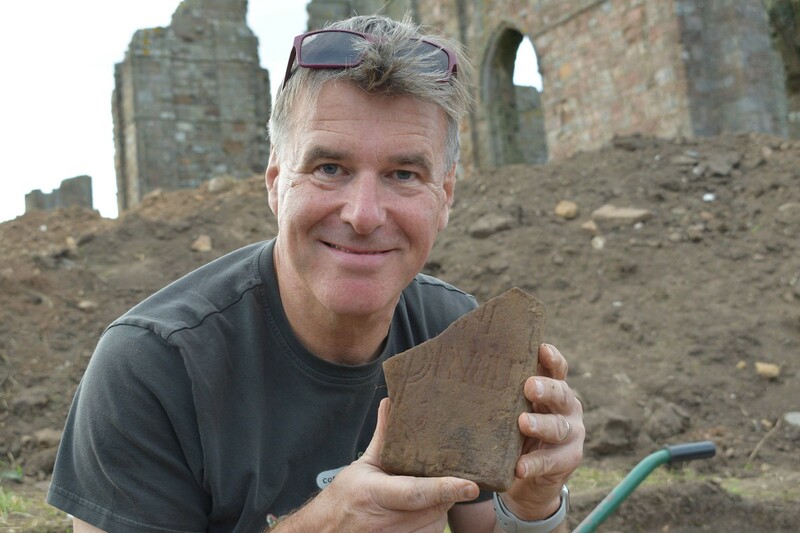 Leading archaeologist Brian Hope-Taylor started work on Lindisfarne having previously excavated the major Anglo-Saxon palace nearby at Yeavering. On Lindisfarne, he excavated a series of trenches along The Heugh, and several trenches in a field to the west of St Mary’s Church. Only recently have his notes and plans become accessible. The overgrown ruins of the later Norman Priory were cleared in order to present them to the public. A large number of archaeological finds were recovered; amongst them were fragments of Anglo-Saxon sculpture, suggesting that the original monastery lies somewhere near the later priory. Historians had always known about the Anglo-Saxon history of Lindisfarne, but it wasn’t until in the late 19th century that the first remains from this period were found. A small collection of Anglo-Saxon stone carvings was placed in the parish church. Life for the villagers on Lindisfarne in the 18th century was dominated by fishing and farming, with the lime industry becoming increasingly important in the 19th century. The picturesque ruins of the Norman Priory became a common subject for Romantic artists. In the 17th century, Lindisfarne held an important strategic role on an unstable border with Scotland. Lindisfarne Castle was built, and together with Osbourne’s Fort, which lies on the east end of The Heugh, it protected the important harbour on the island. In the mid-16th century Henry VIII abolished all English monasteries, including Lindisfarne Priory, and it was soon turned into a fortified military base. Although not all the planned defences were built, a naval supply base was constructed to the north at the site known as The Palace. Lindisfarne stood on a troubled frontier. North Northumberland was the site of many battles between England and Scotland, with the Scottish kings regularly raiding the area. As a result, the monks took the unusual decision to provide the monastery with defences. After the Norman conquest, and its destruction at the hands of Viking and Scottish raiders, the monastery at Lindisfarne was re-built, with the new monastic church and buildings re-constructed to look like those at Durham. The ruins of these structures can still be seen on Lindisfarne. The Anglo-Saxon monastery on the island faced the wrath of raiders, both from Viking lands and from the increasingly powerful Scottish kingdoms to the north. Even then, it’s clear that some monks remained on Lindisfarne continuing to maintain the church and monastery. The most important monks gathered together the holy relics from the monastery and left the island, seeking shelter from the Viking raids. After spending just over a century moving around Northern England, the monks finally found a new home in Durham in AD995, where the relics still lie. Lindisfarne was one of the first places in England to suffer a major attack by Vikings. Its wealth and exposed location on the North Sea coast made it a tempting target to Scandinavian raiders. During its Golden Age, Lindisfarne attracted many pilgrims to the shrine of St Cuthbert and was supported by the mighty kings of Northumbria, one of the most powerful kingdoms in Anglo-Saxon England. Under their patronage the monastery acquired large estates in Northumberland and beyond. Famous for its intricate designs and finely crafted decorations, this gospel book was probably created as part of the process of building the cult of St Cuthbert, a prominent monk at Lindisfarne. The Lindisfarne Gospels are one of the highlights of early medieval art. In this year the body of St Cuthbert was removed from his grave in the main church and placed in a new shrine. This marked the beginning of a new cult centred on his relics which attracted many pilgrims to Lindisfarne. Cuthbert was born in the Scottish borders and first became a monk at Melrose, before becoming head of the monastery on Lindisfarne in AD655. Although he eventually became a Bishop, he spent his final years as a hermit on the island of Inner Farne just across the sea from Lindisfarne. Oswald, the new king of Northumbria, founded the monastery on Lindisfarne with the help of Aidan, a monk from the Scottish monastery of Iona. This introduced a distinctly Scottish and Irish strain of Christianity to Northumbria. The early medieval text, Historia Brittonum states that the British warrior king Urien of Rheged besieged the Angles and defeated them on Lindisfarne. Lindisfarne lies nearly 50 miles north of Hadrian’s Wall and was only briefly part of the Roman Empire. 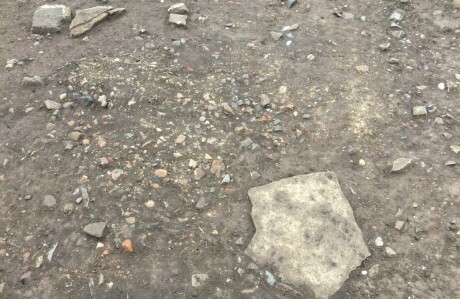 Only a few fragments of Roman pottery have been found on the island, although the Roman road known as the Devil’s Causeway ran nearby on the mainland heading towards Scotland. The mainland opposite Lindisfarne was heavily occupied during the Iron Age; cropmarks have shown traces of defended farmsteads and hillforts. There is limited evidence for activity on Lindisfarne, although a possible enclosure was found in a geophysical survey in 2012. Small bands of prehistoric hunters and gatherers use the island for its many sources of food, including fish, wild birds and seals. 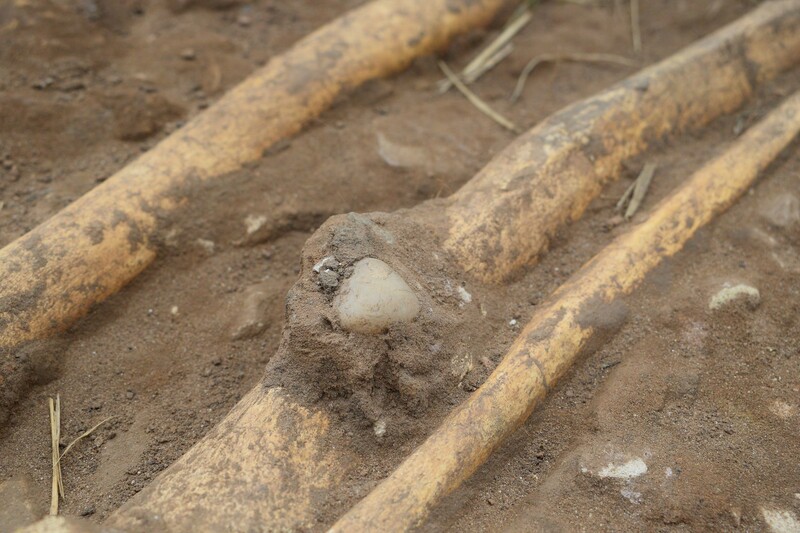 Archaeologists have found their flint tools on the north side of Lindisfarne. Storm Ali has blown across the island, but our team has been busy investigating an Anglo-Saxon building. Inside, the team has found two ovens or small kilns. But one of them has been cut through by a grave, meaning that the ovens must predate the burials… could this building predate the 8th – 9th centuries? 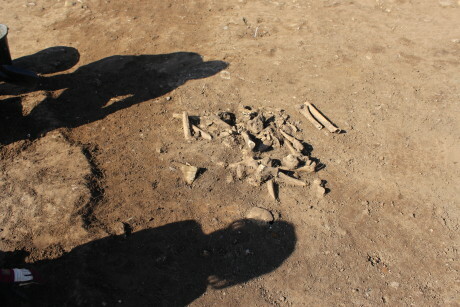 Among the rubble, the team has unearthed two in situ burials. Once they have been carefully excavated, they’ll be analysed by an osteologist from Durham Uni, before being reburied on the island.